I believe these changes are really going to shake some things up if they are implemented in a way many people beleive is required. For the first time, someone will be able to carry a gun and have access to parts of the Rapidan that have been inaccessible in the past (Big Tom Mountain) and much easier access to parts that have been very difficult to access (much of South River Tract). Unfortunately, I see potential for considerable friction between NPS authorities and hunters seeking better access to the Rapidan. While I think it is likely a hunter will be able to park on Skyline drive and conveniently transport a hunting rifle to the South River Tract, my understanding of Park Service regulations is it would be illegal to posses any animal that has been harvested on state-owned land while crossing Shenandoah National Park. This means that for part of the RWMA hunters will have legal access to the RWMA only by carrying a gun across SNP, but there will be no legal way to transport game out. For other parts of the RWMA you will have hunters who have access through SNP, but to get big game out you would have to have a four wheel drive vehicle and it would probably take two men more than a full day to legally transport harvested game out of the RWMA. Look at a topographic map and see how easy it would be to access the Southern part of the South River Tract from SNP, but how hard it would be to transport big Game harvested there by having to only transverse RWMA land. 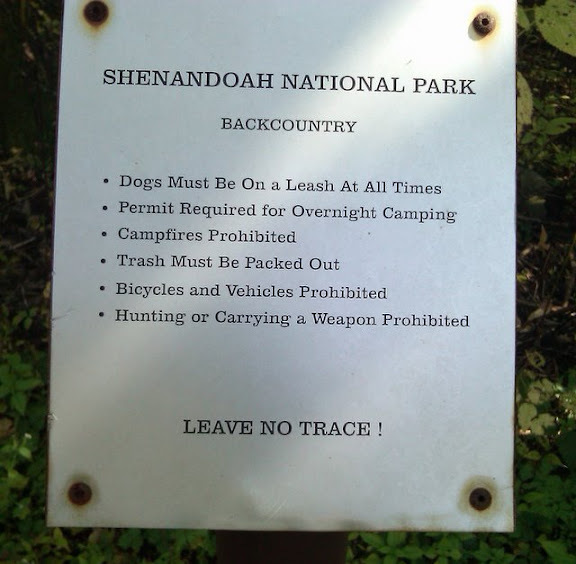 In the past the Park Service has created a permit process that allows access to the Devil’s Ditch portion of the RWMA to hunters using a specific trail, with significant restrictions. The permit also allows hunters to transport harvested game along the trail to get it back across the park to a vehicle. That is the only place in SNP that hunters are currently provided such access. It will be interesting how the permit process for Devil’s Ditch will work in the future if you don’t need the permit to get your gun across the park to the RWMA, but you would have to get the permit before you transported any game that was harvested back to your vehicle! My hope is that once we get a good feel for what gun regulations will be effective next February that the state could try to work out an agreement with the Park Service on how all this will work. Unless it is coordinated well, I think there will be some very confused hunters and an enforcement nightmare for the Park Service. In a way, I look forward to the federal and state government having to sort this out — I think it is a real shame the access issues that have been ignored to let the problem be as significant as it now is now. My hope is that when this gets sorted out that the Park Service will designate trails in SNP that can be legally used to transport harvested game off of the RWMA, but I can’t say I have a lot of confidence this will happen immediately. Anyone have a guess for how all this is likely to work out? This entry was posted on Tuesday, November 3rd, 2009 at 1:41 pm	and is filed under Hunting, Regulations. You can follow any responses to this entry through the RSS 2.0 feed. You can leave a response, or trackback from your own site.